EVER since the financial crisis, the world has been plagued by weak productivity growth. One explanation is that in uncertain times firms are keener to take more people on to the payroll than to invest heavily in new equipment. The construction industry has been afflicted by such problems for decades. Since 1995 the global average value-added per hour has grown at around a quarter of the rate in manufacturing. According to McKinsey, a consultancy, no industry has done worse. Things are especially dismal in rich countries. In France and Italy productivity per hour has fallen by about a sixth. Germany and Japan have seen almost no growth. America is even worse: there, productivity in construction has plunged by half since the late 1960s. This is no trifling matter. The building trade is worth $10trn each year, or 13% of world output. If its productivity growth had matched that of manufacturing in the past 20 years, the world would be $1.6trn better off each year. 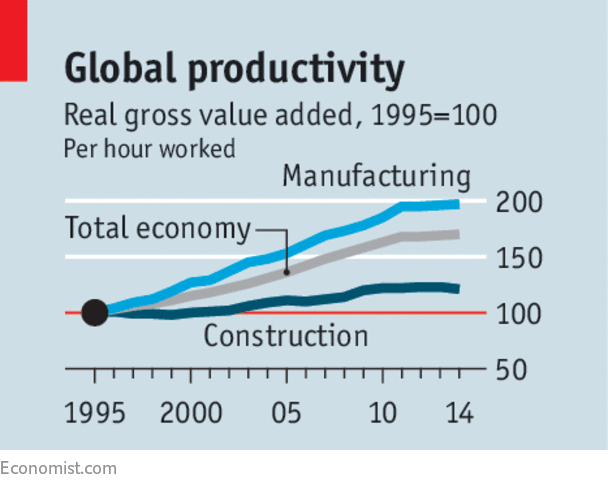 One source of the industry’s productivity problem lies in its fragmented structure. In America less than 5% of builders work for construction firms that employ over 10,000 workers, compared with 23% in business services and 25% in manufacturing. Its profit margins are the lowest of any industry except for retailing. It is also highly cyclical. During the frequent downturns that afflict the industry, any firm that invests in capital, and thereby raises its fixed costs, is vulnerable. By contrast, companies that employ lots of workers without investing much can simply cut their workforces. A few building firms are experimenting with new techniques, from 3D printing and drones to laser-scanning and remote-controlled cranes (see article). But the trade as a whole is reluctant to spend money on the sorts of technologies, from project-management software to mass production, that have revolutionised so many other industries. The clients of construction firms have every interest in lower bills and speedier completions. But private-sector customers are themselves too fragmented to catalyse change. Governments are another story. The public sector accounts for 20-30% of total construction spending in America and Europe. As both a large customer and a setter of standards, it has the clout and the means to encourage the industry to improve. First, governments can mitigate the industry’s boom-and-bust problem by smoothing out their spending on construction projects. Too often public investment is cut during downturns to find budgetary savings. Greater certainty about future work will give firms confidence to invest more in technology. Providing greater clarity about proposed projects can also help. Britain’s National Infrastructure Pipeline, an assessment of planned spending by both the public and private sector, has boosted investment in the tunnelling business because companies can see more clearly what projects lie ahead. Second, governments can encourage the spread of mass production by harmonising building codes. The growth of companies making prefabricated houses can be stymied by the cost of adapting their designs for specific jurisdictions. This is true not just across borders but within them. American counties and municipalities employ up to 93,000 different building codes between them. Standardising rules ought to mean bigger production runs and higher returns. Public-sector contracts can also be designed to nudge companies to adopt new technologies and to co-ordinate with each other more efficiently. Too many construction jobs are still mapped out with pen and paper. Britain, France and Singapore now require bidders for public-sector contracts to use a process called “building information modelling”, a type of digitised construction plan, in the hope that once they have invested in the relevant software, it will be used in private-sector projects, too. Building sites are often home to many contractors and subcontractors. Structuring public-sector contracts so that these firms share in a bonus if projects come in on time and under budget is another example of good practice. The world has an annual $1trn shortfall in infrastructure spending. Those projects that are given the green light tend to come in late and over budget. If the construction industry could build more for less, investors, citizens and customers would benefit. Governments can help lay the foundations. The main puzzle is the disconnect between the performance of financial markets and the real. While stock markets continue to reach new highs, the US economy grew at an average rate of just 2% in the first half of 2017 – slower growth than under President Barack Obama – and is not expected to perform much better for the rest of the year. Congressional Republicans’ attempts to replace the Affordable Care Act (Obamacare) have failed, not least because moderate Republicans refused to vote for a bill that would deprive some 20 million Americans of their health insurance. A lower P/E regime would require a major sustained fall in margins or sustained rise in inflation (or both). • Contrary to theory, the market P/E level does not primarily reflect future prospects. It reflects current conditions. • The variables it weights heavily are not academically or economically correct, but those that make investors feel comfortable. • High profit margins and stable, low inflation dominate this feel-good list, with stability of GDP growth (as opposed to actual growth) a distant third. • Investors’ extreme preference for comfort, like human nature, has never changed. (Tested back to 1925.) This is unlike financial and economic conditions, which have very substantially changed in the last 20 years. • The ebb and flow of these variables explain previous market peaks and troughs. These comfort factors, for example, have been at an extremely high average level for 20 years (as have P/Es) and remain so today. Thus today’s high priced market is the completely usual response from investors. • Any shift back to a lower P/E regime must therefore be accompanied by a major sustained fall in margins or a sustained rise in inflation (or both). • And, yes, I do believe these comfort variables will move to be less favorable. But probably not quickly. In an investing and economic world in which almost everything seems to have changed in the last 20 years, one thing has remained constant: human nature. And, we can more or less prove it. At least in the case of the stock market. Ben Inker and I designed a simple model 15 years ago to explain the shifts in P/E levels of the S&P 500. Recently we updated it. Our model does not attempt to justify the P/E levels as logical or deserved, nor does it attempt to predict future prices. It just shows what has tended to be the market’s typical response over the years to major market factors. By far, the two most important of these are profit margins, the higher the better, and inflation, where stable and lower is better, except not too low. The market’s responses are typically quite different from what one might expect from an efficient market. Let us start with profit margins. In a rational world, stocks should sell at replacement cost. And therefore, above-average margins require a below-average P/E. An alternative way of viewing this is that above-average margins can be expected to mean revert – to move back to average – and vice versa. In real life, though, even in the past when margins were provably very mean-reverting, the market has always preferred high margins. Investors would dependably pay up for high margins, which would then decline, whacking them on the way down. Subsequently, investors would avoid markets with low average margins, which would then recover, causing them to underperform. Over and over again. This, in short, was primitive double counting. In 1974 or 1982, for example, at cosmic market lows, very, very depressed margins would sell at equally depressed P/Es of 6x or 8x, producing a price to book (or Tobin’s Q) of one-quarter or one-third. Conversely, at market peaks like 2000, record margins were multiplied by record P/Es, producing 3x price to book. This double counting is a major market inefficiency, perhaps the major inefficiency, and the main reason why market volatility is many multiples of the stately moves in the theoretical future value of dividends. To sell at fair value – true replacement cost – profit margins must be negatively correlated with P/Es, yet in the real world they are strongly positively correlated. And always have been. Years ago Robert Shiller pointed out that the true discounted value of a future stream of dividends was very, very stable and had been since 1882 at least (see Exhibit 1). Yet we investors, transfixed apparently by short-term events and eager to double count in the manner just described, overreact in what might reasonably be called a hysterical manner. The result is about 18x more volatility for the market than is justified by the fundamentals! And apparently we are incapable of learning this from experience. So much for efficiency. As always, it seems human behavior, sometimes rational and sometimes not, trumps efficient economic behavior. Then there’s inflation, which the market hates despite a history of stocks proving that their fundamentals are robust in the longer term in passing inflation through to consumers. Stocks, unlike bonds, are clearly real assets, so inflation should not matter. But in real life, when inflation first appears or accelerates, there is an immediate, coincident negative effect on P/E multiples. (Modigliani, one of the very few economists who seemed to understand how inefficient the market was capable of being, visited a Boston brokerage house in the depths of 1974, when the market was 7x, and made this point eloquently over lunch. He explained that because inflation was irrelevant to long-term value, the market should always be at replacement cost, or twice the then price. Which it obediently moved to in the following two years. Not a bad call. Unfortunately, he seemed to be uninterested in doing serious academic work on the stock market. Had he done so, the belief in market efficiency might have been less of an expensive and dangerous proposition for society. During the updating last year of our behavioral P/E model, we added two new factors, which we believe provide a little further value. The first addition was an on-off switch, which causes P/Es to be a bit lower after a down quarter. Again, not a very scientific reflex in a mean-reverting world, but understandable. The second was to add the U.S. 10-year bond rate, where higher rates are negative, modestly improving the model even after the inflation component had done the heavy lifting for nominal interest rates. Exhibit 2 shows our original model from 1925 through 2006 compared to actual Shiller P/E (current price over trailing 10-year average earnings). The overall fit is pretty good, but it is much better than that at extremes. In the past, the model explained a record high P/E in 1929, extreme lows in the 1930s, another high in 1965, extreme lows in 1974 and 1982, and a world record high, by a wide margin, in 2000. The outlier nature of the market peak in 2000 – confirmed in our updated version – suggests something interesting: Market peaks (1929, 1972, 1987, and 2008) and market troughs (1932, 1974, 1982, 2002, and 2009) were more or less – and more rather than less – what you should have expected from investors pressured with the comfortable (and uncomfortable) news at the time, as reflected in our model. For those events, you don’t need any further bubble or bust explanations. They were normal behavioral responses to extreme data. 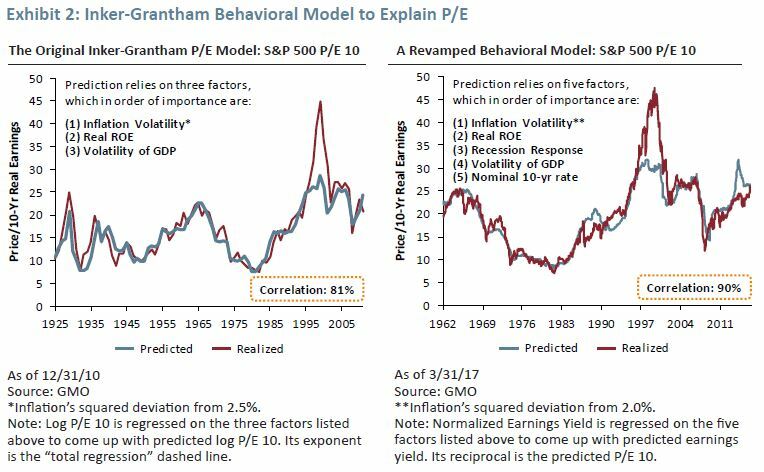 This behavioral model seems, in that sense, like a parallel universe to all our other investment thinking on bubbles. Only 2000 stands out, fully one-third higher than “explained,” as a genuine bubble, beyond these normal factors. The reader can surely pity investors who were hung out to dry in that extra and extraordinary one-third! Even the memory still stings. We might reasonably conclude from this finding that any large and more or less permanent decline in the market (i.e., to a new, lower trend, much more like the 1945 to 1995 period than today) would require an equally large deterioration in profit margins or increase in inflation or some combination. Without either, any large market decline would be very unusual historically and likely, I believe, to be temporary. I can conclude this point by offering my personal opinion for 2017 on the two most important factors: favorable for margins and unfavorable for inflation. If only life were easy! But, even if these guesses prove to be correct, this mixed signal does not suggest a major decline or perhaps any decline. For the record, if you need yet another rebuttal of the Lucas/Fama and French model of economic efficiency on the part of investors, this model is it: a long-term testimonial, and a very stable one, to investor behavior that they would have to describe as inefficient by their definition. And though this investor behavior may be loosely described as rational, it is certainly economically and financially innumerate. I am happy to say that I never believed a word of their theory on the efficiency of the market, which I have always thought is better described as a behavioral jungle. But having said that, I must admit to having detracted from my usefulness as an investor by assuming that investors overall would at least respond sensibly most of the time to the data they are given. And they do not. The effectiveness and persistency of our behavioral model, almost all the components of which should not work in a resolutely sensible world, let alone an efficient one, should have persuaded me to change my thinking years ago. But, here I am, trying to explain during these last nine months or so why the general discount rate of assets has dropped by roughly two percentage points from the 1900 to 1997 average. My proposed reasons for the reduced discount rate come down to a complicated stew of factors, most of which interact with the others: higher profit margins; higher leverage; lower rates; aggressive Fed and central bank policies to push rates lower; moral hazard from the Fed that may be more important than rates – the asymmetry of helping in bad times and letting good times run; changes in the age profile of the developed world; slower population growth; lower productivity; lower GDP growth; less low-hanging technological fruit; loss of the old $16 a barrel oil; extreme income inequality; remarkable lack of progress in median and lower hourly wages; and very much enhanced corporate political and monopoly power. Phew! I truly believe we will never know for sure which factors dominate the equation, although my favorite is Fed policy and the runners-up are an aging population profile and the rising political and monopoly power of corporations. But whichever they were, they got the job done: For the last 20 years profits in the U.S. as a share of GDP and corporate revenues rose by about 30% and P/E ratios by 70% above the old normal. Now, cutting across that previous attempt to understand these major changes in our new 20-year era, comes an entirely behavioral approach. Whether sensibly or not, investors love high margins and like stable growth even if it’s modest, and hate inflation. They felt this way from 1925 to 1997 and they felt exactly the same way in our new era of 1997 to 2017. So, behaviorally it is absolutely not a new era. It is precisely – to a 0.90 correlation – the same ole same ole. The peaks of 1929 and 1965 delivered favorable margins and inflation inputs but for a very short while in both cases. In contrast, the period of 1997 to 2017 has delivered to investors their preferred conditions almost the entire time, with only two very quick time-outs for market breaks. Can the market really be this easy to explain? Well, it has been for 92 years! And what can we investors do with this information? It tells us that if we re-enter a period of old normal profits and old normal inflation, the market’s P/E will indeed mean revert to its old average. And if we don’t re-enter such a period, the P/Es are likely to stay high. It tells us separately that if we expect a market crash, we should also expect to have a crash in margins (as we did in 2008-09) or a truly dramatic rise in sustained inflation (as we did in 1979-81) or some powerful combination. All of which is possible of course, but I think improbable, at least in the near term. This behavioral approach to explaining shifts in P/Es is certainly a much simpler equation than my previous stew-of-factors approach. But it does have some powerful similarities to my earlier arguments found in Parts 1 and 2 of “Not With A Bang But A Whimper. In both approaches, the role of profit margins is dominant. Improved margins not only move the earnings up directly, but also the P/E multiplier applied to those earnings. Inflation is also a strong secondary factor in both approaches, for low inflation, of course, drives down the interest rates, which appear to be an important ingredient in the stew. So, where does this leave us? It suggests to me that I have in general been over-intellectualizing the working of the market for a few decades. I have had too strong a belief that investors would at least be influenced by past data in a sensible way. The market, however, appears not to care at all about the past or to learn much from it. 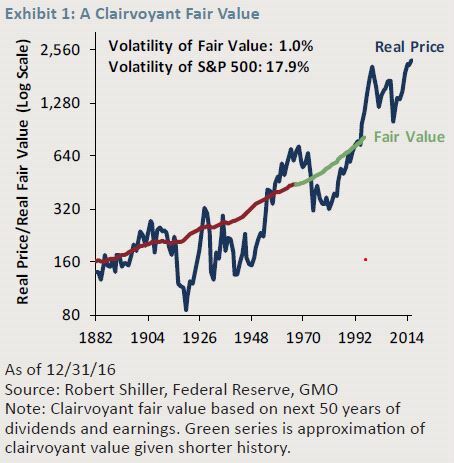 This model for sure seems to say that for 92 years, at least, the market has with remarkable consistency been a coincident indicator of superficially appealing variables that in a strict economic sense have been inappropriate, and that have caused spectacular and unnecessary market volatility. The model is apparently a reflection of human nature and, of all factors influencing the market, human nature, as economically inefficient and unsophisticated it may be, seems the least likely to change. If the short-term behavioral variables described above dominate the short-term market level to the degree shown – a 0.90 correlation – what is the role for both momentum and value? My guess is that there is enough noise in the data for there to be room for many individual stocks to be driven in the short and intermediate term away from fair value by momentum, also a behavioral factor. More importantly for us value managers, I believe there is also enough noise in the data for individual stocks and the market to be pulled back toward replacement cost or fair value. Value (like gravity in physics) is a weak force in the short term, but very, very persistent so it can eventually work its way around the stronger coincident behavioral forces. Value was the beneficiary, after all, of a real world arbitrage: If the market priced a stock too high, management would sell stock and buy more – say, fiber optic cable – until market forces brought the price of the product, the profit margins, and the stock price down. If priced too low, management would buy stock back and reduce the underpricing and, more directly, it would withhold expansion until shortages occurred, sometimes quickly and sometimes drawn out. But more recently, increased monopoly power and other factors appear to have decreased the corporate reflex to expand in favor of stock buybacks, perhaps weakening the previously reliable game. But that of course is the question under consideration. Descending out of the blue just before the July 4 weekend came this no doubt heaven-sent recently discovered talk by Ben Graham titled “Securities In An Insecure World,” which was given on November 15, 1963. It is one of the last he gave. 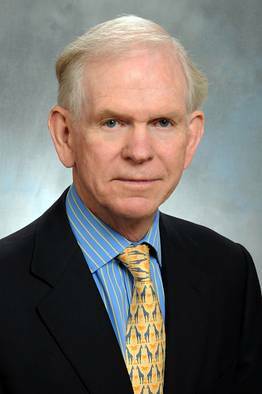 After a 40-year career in which he had developed a fairly high-confidence view on how to define the value of the U.S. stock market, he was having second thoughts. Like some of us now. Here are my favorite snippets. THE easiest way to get an economist to laugh sardonically is to compare a country’s finances to those of a family. It is both simplistic and wrong, they will argue, for politicians to say that a country “must live within its means”. But in a new working paper* from the National Bureau of Economic Research, Patrick Bolton and Haizhou Huang make a different comparison; between the finances of a government and those of a company. A business can finance itself in three ways: through internal funds (its revenues); through borrowing; and through equity (the issuance of new shares). In the first two cases, it is easy to see the analogy with a nation state; governments can raise money from taxes or borrow in the form of government bonds. But the paper’s most striking idea is that the national equivalent of equity is fiat money. Governments are able to issue money that can be used to settle debts and pay taxes—the term “fiat” comes from the Latin for “let it be done”. Equity gives its holders a claim on the assets and profits of a company; money gives its holders (citizens) a claim on the goods and services produced by a country. Inflation can be explained with another analogy. If a company issues shares to new investors for less than their true value, the holding of existing shareholders is diluted. “Similarly when a nation issues more money to new holders while adding less real output than the purchasing power of money, then existing holders of money are also diluted in proportion to the transfer of value,” the authors write. The authors draw a parallel with a well-known concept in corporate finance—the Modigliani-Miller theorem. Franco Modigliani and Merton Miller proposed that, in the absence of a range of complex factors like taxes and bankruptcy costs, the value of a company should be unaffected by how it is financed. To spell this out: the enterprise value of a company represents the combined value of its shares and bonds. The bondholders have first claim on its cashflows. If the company suddenly issues a lot of bonds, its shares will become more risky and will fall in value, but the overall enterprise value will be unchanged. With the help of some fancy maths, the authors say that a similar argument can be applied to national finances. Assume that a country wants to invest to improve its productive capability. It can choose to finance these investments by borrowing in foreign currency or issuing fiat money. In an economy without “frictions”, it should not matter which of these options it chooses. A version of the Modigliani-Miller theorem thus applies. In the real world, of course, there are bound to be frictions. One of these is a side-effect of inflation. This may not be a problem in an ideal economy. 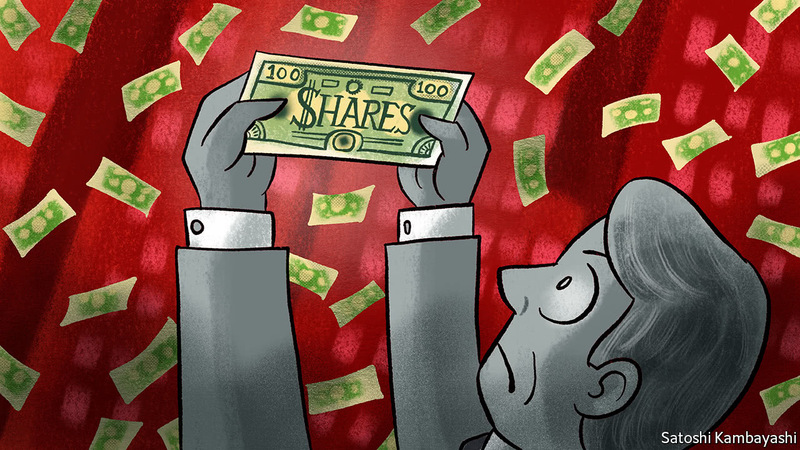 Consider a stock split; some companies with high nominal share prices issue new shares on a pro-rata basis. So a company with 10m shares trading at $500 each could issue another 10m shares; the price should fall to $250 and the overall value of the company would be unchanged. No one loses. If governments issuing new fiat money could distribute it equally to each citizen, the same arguments would apply. Instead, however, governments tend to use new money to buy financial assets, or goods and services. So the gains are not evenly distributed. This is the real cost of fiat-money issuance—the transfer of wealth from some citizens to others. But borrowing also brings risks. A country with too high a debt ratio may default on its foreign-currency obligations. The result may be a shock: much higher interest rates or lost access to the credit markets that may damage the economy. So when a rational government finances investments, it is choosing between the redistribution risks caused by inflation and the risk of default on foreign debts. It is an intriguing way of formulating the debate, particularly in the light of the extensive use of quantitative easing by central banks since the financial crisis broke in 2008. This has caused less inflation than many feared, which has led some economists to argue that there is little constraint on the ability of rich-world governments to finance their spending, provided a central bank is willing to issue fiat money at will. But what counts is confidence. Countries can find eager takers for their debts and willing holders of their money. Until, at some point, they won’t accept them any more. Predicting when that point occurs is the tricky task, for economists and non-economists alike. - Rotation from growth to value is accelerating with gold/silver. - Both gold/silver and miners deserve a place as value assets – gold/silver as cash equivalents and miners as stock holdings. - Timing is reinforcing by recent events to be favorable for both the short and long term. 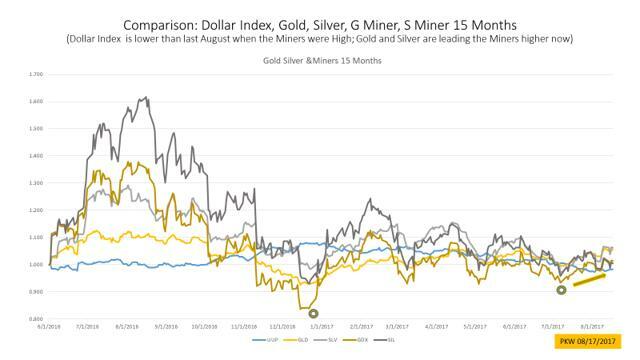 Thesis: Gold/silver and miners are good short- and long-term investments as global political and financial stresses increase. Collective Wisdom - The best answers are most often provided by sharing the collective wisdom of a group of knowledgeable people with different expertise for the common goal to benefit all. Effectively, we are building an intelligent 'Ark of Higher Knowledge' together to prepare and prosper even with the coming financial storm. I have expanded this article to silver and silver miners which are following gold higher. This article is an update of my August article, which can be found here. Gold/silver has advanced and the uptrend will likely continue. At the highs of stock and bond markets, the smart moves are to rotate from growth to value, from financials to real assets, and gold is the ultimate real value asset. The elevated conflicts globally in the past two weeks have enabled gold/silver to ascend. Investment is all about relativity, or locating relative value in this case. In our complex financial world, relativity permeates all asset classes to connect them. As such, mathematical tools that were developed, such as base comparison, correlation etc., can be used to track and sometimes forecast each asset class. 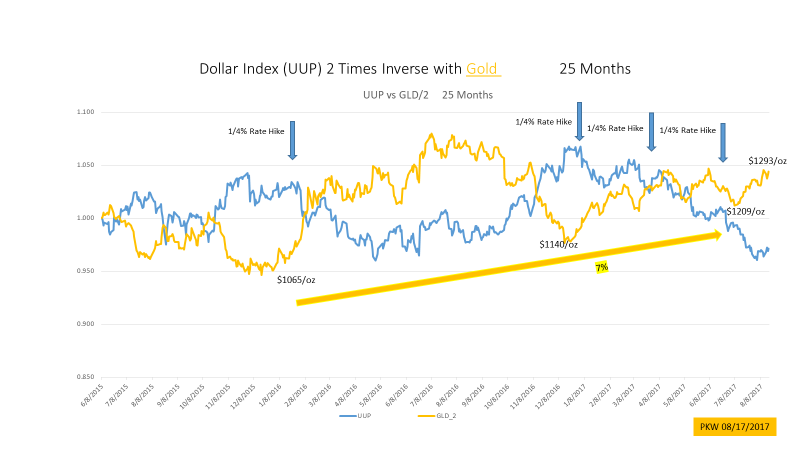 The performance of gold (GLD in the gold color) empirically is inversely correlated to the Dollar Index in the blue color (UUP) multiple by a factor of approximately 2 (as shown below). As such, the dollar index alone has the most influence over the price of gold short term. Dollar index is descending to the lowest level in the past 15 months. The fall reflects the problems internally with increasing budget deficits and record national debts in the form of treasury bonds. The economy appears to be fine but growth seems very limited. Most likely, the dollar index will stay at or close to this level for the next few months until the debt ceiling debate is over in October. Gold is trending up, from $1209 in July towards $1300. Seasonally, August to October are good months for gold. 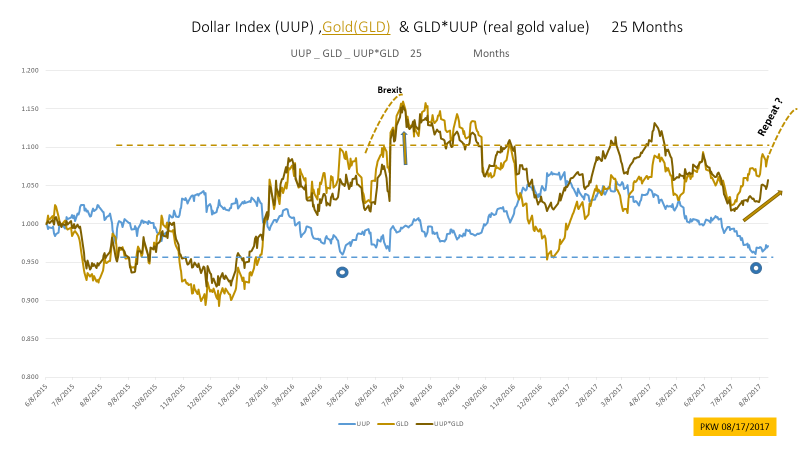 To measure the true or real value of gold by multiplying it with the dollar index (UUP*GLD in the brown color shown below), the recent rise confirms that gold's up move is real by overcoming the weakness in the dollar. This is a good way to gauge the global confidence in gold, as it is traded internationally. Looking at the last top for gold in May to July 2016, dollar index was at the same level or higher than today; gold conceivably can reach the same target of $1375 according to the dollar index. The last top was the result of anxiety about political uncertainties in Europe leading to Brexit. This time, there are even more uncertainties with higher stakes because of disagreements among the major countries. Each week, there is more escalation in rhetoric. The condition now is quite conducive for gold price to follow the up move and repeats the top of 2016. There is still plenty of room to move to the $1375 level again within three months. 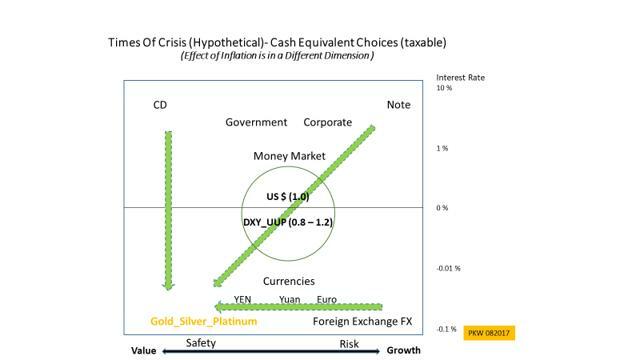 The above illustration depicts the potential flow of cash equivalents to gold during times of increasing turmoil in the financial or stock market. The best example was the last crisis from 2007 to 2009, gold rose 50% while the stock market dropped 50%. Another note of the financial crisis was the performance of long duration treasury bond, it rose 30%. However, this time treasury bond may not offer the same safety net long term mostly because bondholders may demand higher interest rates due to much higher national debts. As such, gold may remain the lone choice to guard against chaos. Holding dollar index constant and with ultra-low interest rates today, the returns are quite low -- except potentially for gold by assuming gold preserves value. The simplest concept is hardest to grasp because we are swayed to believe the alternative to truth about the magnitude of inflation. Of course, inflation is very real; as real as growth rate of money printing which is part of the definition of inflation. The heart of the argument to seek the truth about inflation is to identify the best indicator or indicators. 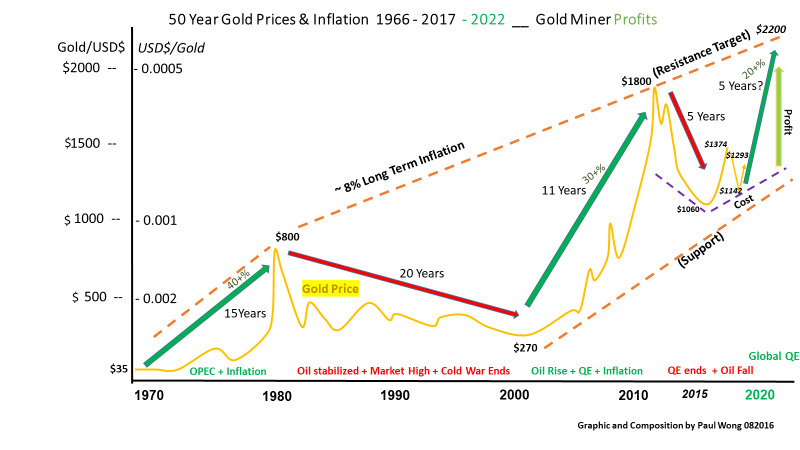 Taking gold as an inflation indicator, the average rise in gold price is averaging 7% compound annually for the past 20 or 50 years, including bear and bull runs that last 5 to 15 year each. 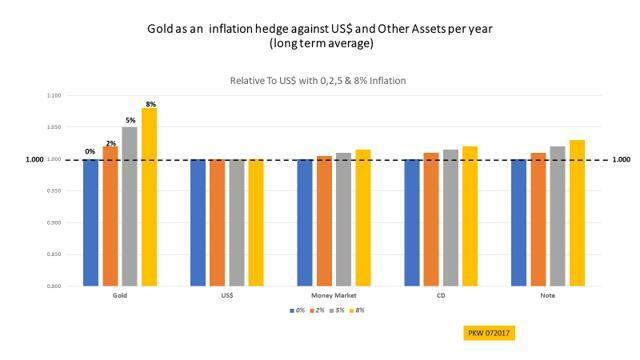 Since gold is money, adopting long term average of 7% is a good way to determine true inflation. Some may say that gold is not a good indicator, but maybe there is no perfect one. We may try other high inflation indicators such as rent or health cost, each of them will likely be imperfect. Money supply growth M2 averages approximately 7% for the past 10 years, which is one of the best way to gauge as inflation. From Shadowstats, applying pre-1982 methodology, inflation is running 7+% for the past ten years. By any measure, 7% inflation number seems to agree more with the increase of overall daily expense increase; 5% more than the official inflation number. There are huge consequences if inflation is higher, real returns on all assets will be much lower or negative. Therefore, we need to focus on investments that have high returns to overcome the effect of the potential 7% real inflation. Of all liquid asset of value preservation, gold may be the only one that can keep up with real inflation. Short story on hyperinflation - I was in China a few years ago. I met an old professor who showed me a book of stamps from 1942 to 1949; during WW2 and before the Communist takeover. The price of the same stamp went up from 50 cents to 500 dollars. The only thing that came through my mind was, no wonder the Nationalist was defeated, not necessary militarily but economically by inflation. The past four months have been unusual that oil price declined and hit bottom from April to June, instead of rising at the beginning of driving season. Mostly, importing nations exerted their superior political and financial influences to flood the market as much as possible to keep the inventory from declining too fast. The result was oil price has been low through most of the driving season. Oil price started a slow and steady recovery since June. Lately, global demands are healthy and the increase is 1.3 million barrels per day in 2017. The shale oil companies were announcing reductions in capital spending for the rest of the year; the cut back will slow down production increase. Supplies probably fell behind demands currently judging from the declining global inventories. With supply disruptions such as the deteriorating situation in Venezuela, outlook appears to be getting better for oil price to rise for the next two months. If oil price heads up rapidly, global inflation will follow. Interest rate has been drifting down recently due to dollar weakness, with no immediate interest rate hike. All these factors will likely continue for the next few months. Lately, the Fed is wavering about quantitative tightening or rate normalization; dollar will stay weak for the next three months to provide the background for gold to move up. Keeping interest rate low is good for gold. The simple yet elegant figure illustrates the effect of interest rates on bond prices, with respect to falling and rising interest rates. The concept applies to all bonds by just changing the scales on the y axis, and shifting the time slightly on the x axis. Long duration bond peaked last year, junk bond appears to be peaking. Junking the junk will become fashionable again. 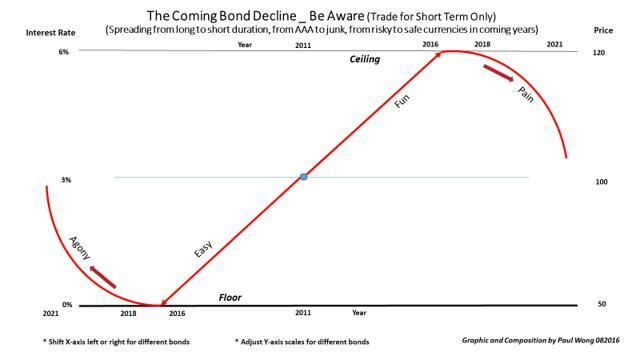 The robust usage of the figure above makes visualizing the effect of rising interest rate and falling bond price easy. Normalization of interest rates back to the higher levels will bring about losses to almost all bonds. Losses on mid duration bonds, real and nominal, began to appear since 2016. Real positive returns, yield with inflation plus gains/losses, should be the reason for investing in bonds. For the past 35 years, increasingly gains in bond price surpassed yield as the main driver for bond investing until last year when interest rate hit zero, and rates started to rise. Gains in bond price became losses. The odds are the glory decades of bond investment are over globally. The example above shows that with interest rate on the way up after hitting the floor, chances are losses in bonds will spread and accelerate in the coming years. Case in point, the CEO of the best major bank remarked last week that he personally will not buy any long duration sovereign bond as long-term investment. The figure and formula above demonstrate his opinion vividly. Considering all the domestic and foreign news for the past three weeks, there is some nervousness in the market. Instead of glorifying FAANG, we are watching ICBM. International incident can be a trigger for this overvalue stock market to fall. The Dollar Index UUP (in blue) is very weak for 8 months, as shown in the chart below. UUP*SPY (in gray), which is the real value of the stock market, has been declining since March. The downtrend means that the stock market might not be strong as it looks. As the stock market (SPY) (in orange) is forming a top, all the patterns together are worrisome. Judging from the declines small stocks and loss of breath in the market for the past 4 weeks, a correction may be under way already. 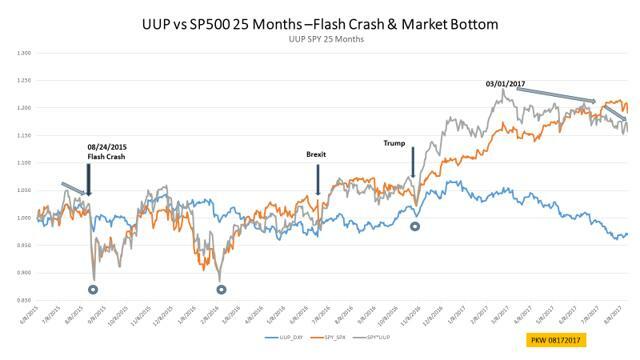 A repeat of the August 2015 flash crash or correction is becoming more likely in the next 2 months. International conflicts appear to be heating up since last month. Instead of economic cooperation, major powers switched to confrontations in many areas. The increase domestic and foreign tensions are the main reason that gold is performing nicely and ready to continue the upward march towards another high. Debt ceiling debate in September will soon be the main topic. Most likely, the heated bargaining will last till the very end, before an agreement will be compromised in late September. 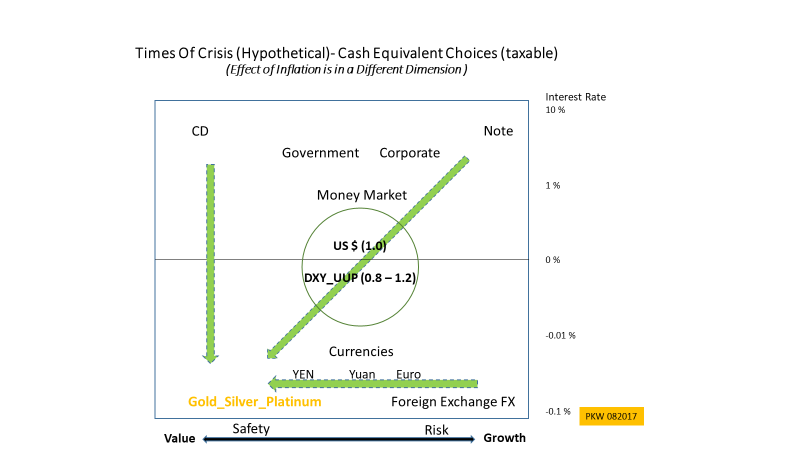 Uncertainties will keep dollar low and aid gold during this period. At market tops, rotation from growth to value asset is a smart move. The current gold bull run is still young and the price is reasonably low considering the factors described; in comparing to other financial assets such as stocks and bonds which are vastly overvalued. 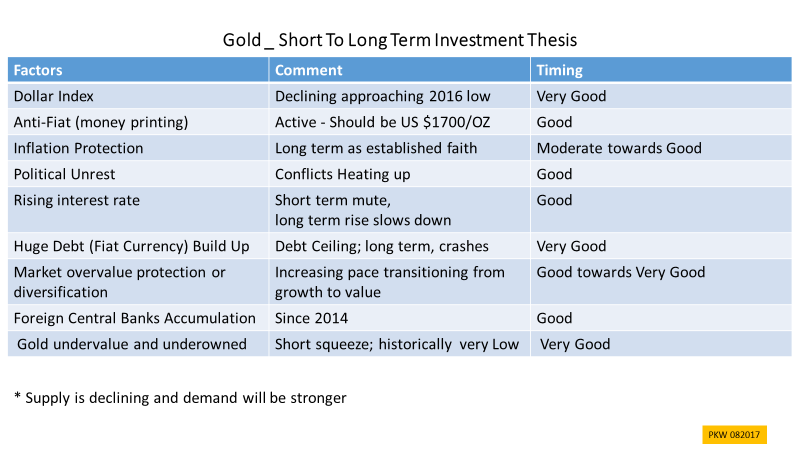 Increase asset allocation to gold ahead of the crowd can prove to be prudent. As measured in other currencies reflecting the 10% devaluation of the dollar since December, gold becomes quite cheap for European or Asian investors. The Germans have increase their gold purchase. Banks and central banks need to accumulate more gold to keep a higher percentage in the Tier 1 asset to prepare for the coming crisis. Demand from global investors are increasing in 2017. Supplies are falling according to schedule since peaking in 2015. Reduction in capital expenditure for the past few years have kept production low. Reduction in scrap metal recycling this year also reduces supplies. The above graph has been updated with the recent price of gold, and the devaluing scale of USD based on gold. Basic conditions for each bull and bear run are labeled. 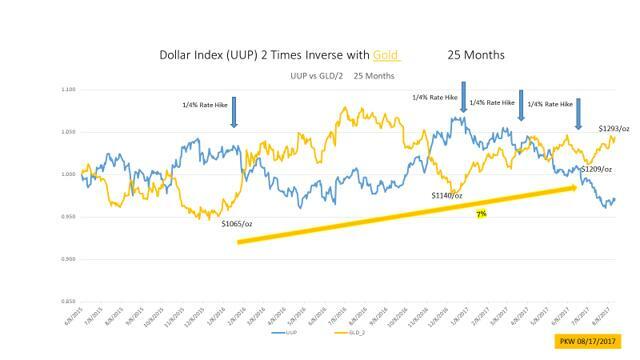 The long-term perspective of interplay between gold and USD reveals the true reason that we ought to have faith in valuing gold, as oppose to the dollar and other dollar based financial assets. The anticipated current bull run's annual rate of increase can exceed 20%. 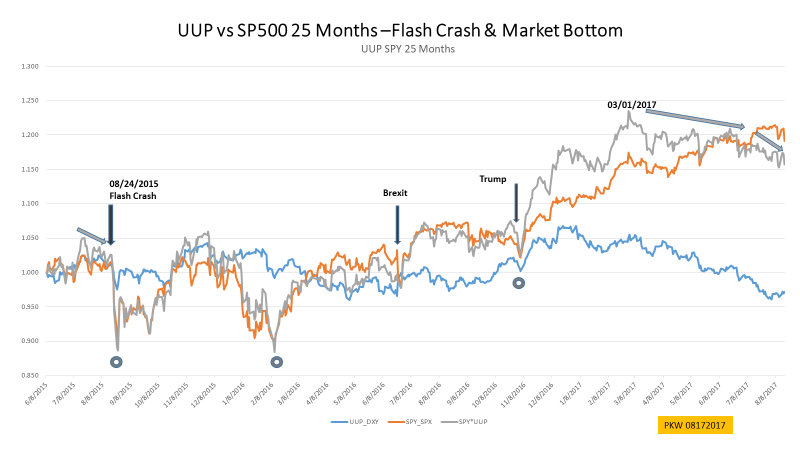 The last bottom in the December 2015 reversal served as the bottom and the starting point for the next up leg toward 2020. Gold has been leading silver since the July 7 bottom. Silver was coming to live and responded strongly. 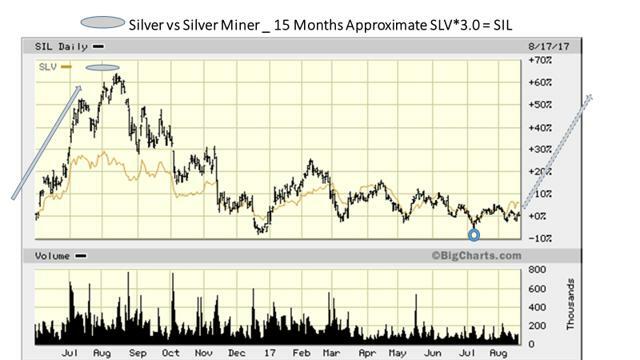 Both gold and silver miners have been following gold's lead. If gold continues to move up and breaks $1300, the miners most likely will surpass the performance of gold in the coming months. The reason being profitability above cost, as price increases above certain threshold, earnings will accelerate. 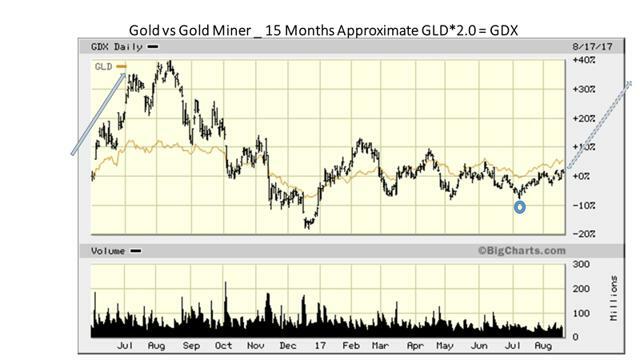 During bull runs, investing in miners (GDX) is much more rewarding than gold GLD itself. The following chart shows the potential for gold miner's advance back to last year's high from the current low level. By the same token, silver miners offer a larger potential if silver continues to move up towards the high of 2016 again. The above charts are comparisons among dollar index, gold, silver and miners. 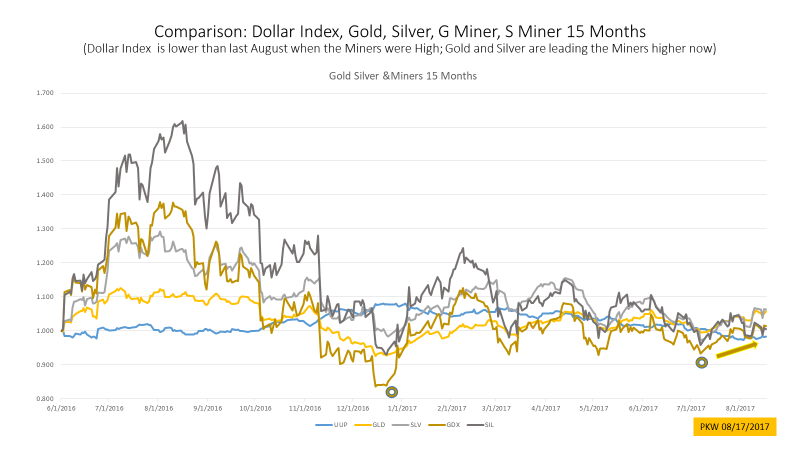 The main point is if dollar index stays at the current level, political events around the world can move the prices of gold and silver to the July 2016 highs; the miners will likely respond accordingly to reach similar levels respectively. In describing the truth about gold amid all the fabricated noises around us. We better train ourselves to know the difference, otherwise we will get hurt financially. With markets topping out while gold and miners advancing, it is time to rethink about asset allocations. A rational move these days is to increase the portion for gold to 10% or more of cash equivalents, and additional 10% or more of stock holdings in miners. 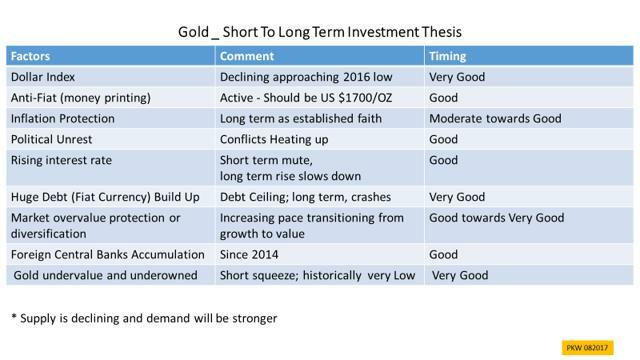 The seasons of the ten-year investment cycle is changing, so gold accumulation during up move is the theme. Let us track along the uptrend together. The true meaning and import of Donald Trump is an evolving mystery across a wide variety of fields, from trade to foreign policy to taxation. In few places has the apparent impact of the US president swung so dramatically as in the currency markets. When Mr Trump was surprisingly elected in November, the dollar, along with US equities, set off on a tear upwards. The move rapidly became known as the Trump trade and was taken as evidence that the US economy, fuelled by forthcoming big infrastructure spending and tax cuts, was set for a period of surging growth. As it happens, fiscal stimulus has failed to arrive on either the tax or the spending side, stock prices in the other developed markets have caught up with US equities and, most strikingly, the dollar has gone into sharp reverse. Having started 2017 at a 14-year high, the trade-weighted greenback has fallen by more than 9 per cent this year and is close to a low last seen in early 2015. This may be bad for currency traders who bet heavily on Mr Trump. But it is, ironically, exactly what the president himself called for on the campaign trail in order to benefit American exporters. Though Mr Trump probably does not care, it also has happy implications for emerging markets. Trying to explain movements in currencies generally tends to end up in post hoc rationalisation, which then fails to predict the next development. In theory the dollar’s weakness against the euro, for example, can simply be seen as evidence that the eurozone economy is surprising on the upside. But this has yet to be reflected in changing differentials in bond yields, which are the most obvious transmission mechanism from the economy to the currency. The Federal Reserve has raised interest rates twice this year, while the European Central Bank is busy insisting that monetary policy is on hold for a long time to come. True, the dollar’s fall may reflect political uncertainty, particularly given the air of chaos surrounding Mr Trump’s administration. But then that might be expected to show up as a higher risk premium in US assets more generally. Certainly, the traditional beneficiaries of a weaker dollar have been doing well. US corporate earnings, which are boosted by a lower exchange rate, have gone from strength to strength. And emerging market assets have also thrived. Iraq, no one’s idea of an investors’ darling, conducted its first independent bond sale in more than a decade this week, following Argentina’s successful placing of a 100-year bond in June. 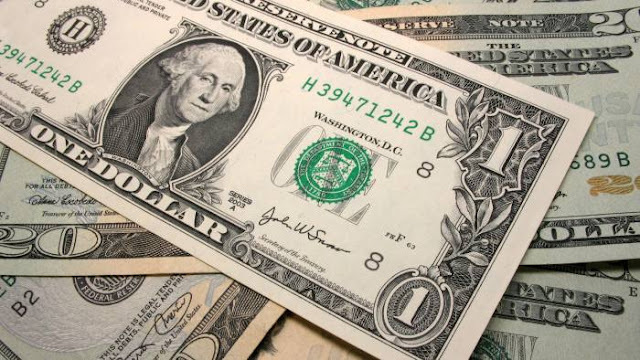 However, given the uncertainty over just why the dollar has fallen, its beneficiaries should be grateful but also wary that the good times may not last. And if Mr Trump is expecting the weaker dollar by itself — together with aggressive mercantilism on trade — to fix the US’s current account deficit, he is likely to be disappointed. Exchange rates do affect the current account but they rarely rebalance it on their own. Investors and companies convinced that the dollar will remain weak need to be aware that the cause of its recent movements remains unclear. Mr Trump’s administration may become engulfed in greater scandal, and that may weaken the dollar further, but neither the cause nor the consequence is certain. The greenback’s value appears at the moment to be generally beneficial in rebalancing the world economy and helping emerging markets regain confidence after a difficult few years. But it would be foolhardy to imagine that the dollar’s remarkable slide this year cannot quickly be reversed.